"Picky Mrs. Pickle won't try anything at all;Nothing but green dresses filled her closet in the hall..."An oldie and a goodie -- 16+ years after its release, I can still quote this book nearly word-for-word. 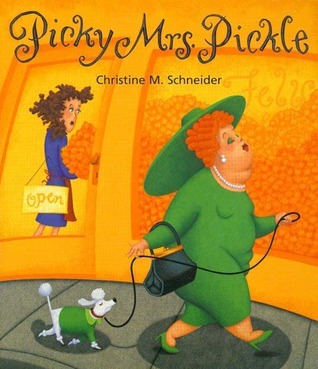 Title: Picky Mrs. PickleAuthor/Illustrator: Christine M. SchneiderGenre: Picture BookTheme(s): Open-mindedness, Perception Opening line/sentence: Picky Mrs. Pickle won’t try anything at all.Brief Book Summary: Mrs. Pickle is very set in her ways and refuses to do anything outside of what she is used to doing on a day-to-day basis. The stubborn protagonist only wears green, only eats pickle flavored foods, and is not willing to make new friends. When Mrs. Pickle’s bold niece dares her to try a new ice cream flavor, Mrs. Pickle’s world is turned upside down when she realizes that she actually likes something that is unfamiliar to her. From that point on, Mrs. Pickle is passionate about trying and doing new things.Professional Recommendation/Review #1: Kirkus (Kirkus Reviews, 1999) Mrs. Pickle is definitely a vision: she's rather pickle-shaped herself; is always dressed in her favorite color, green; has the tight orange curls of Lucille Ball; and plays fast and loose with some pickle-green eyeshadow. She has her favorite things and favorite habits, and she won't try anything new because "I like the things I like." Her niece, Sophie Claire, however, bored with all things pickle, makes her aunt an offer she can't refuse, and Mrs. Pickle at last tries a different kind of ice cream--eggplant ripple. She finds she likes it, and the final spread shows her in a bright red frock, learning to paint. The rhymed text is a little clunky and its message isn't for the subtle, but the pictures, with their acid greens and exaggerated gestural figures, have charm; children will see themselves in Mrs. Pickle's picky habits, and have a good laugh. Professional Recommendation/Review #2:Publishers Weekly (Publishers Weekly) Mrs. Pickle wears nothing but green and eats nothing but pickles. "Anyone who has attempted to persuade someone stuck in their ways to try something new will find an ally in this buoyant tale of an eccentric who finally gives in," wrote PW.Response to Two Professional Reviews:I certainly agree that Mrs. Pickle is quite a vision throughout this silly picture book. I also agree with Kirkus Reviews’ statement regarding the charming illustrations—they are sure to have young readers giggling by the conclusion of the story. Additionally, both professional reviews address the ease with which readers can relate to Mrs. Pickles’ stubborn nature, and I agree that this is definitely an appealing aspect of the plot.Evaluation of Literary Elements:The text in this picture book is purposefully simple and includes an audibly pleasing rhyme scheme that will help to keep children engaged in the story. The bland font reiterates the emphasis placed on the illustrations that almost always take up the entire page and even sometimes two pages. The exaggerated expressions of the characters add notable personality to this picture book, as well as humorous detail that readers will not be able to resist laughing at.Consideration of Instructional Application:Due to the simple plot line of this story, this text is ideal for preschool, kindergarten, and/or first grade students. As a teacher, I would use this picture book as an interactive read aloud, asking questions pertaining to the information that students can gather by looking solely at the illustrations. As I touched upon above, the facial expressions of the protagonists are very telling of their personalities and how they feel about various events that take place throughout the story, and thus I will encourage my students to draw conclusions about the characters based on the evidence they gather from the illustrations. This is also a fun story to encourage the sharing of predictions, as well. Will Mrs. Pickle try a new flavor? Do you think she’ll actually like it? Will she change her ways forever? This book makes for a very fun guessing game! This is a cute rhyming story about a lady named Mrs. Pickle who is very picky and particular and does NOT like trying new things. But after a deal her niece makes with her, Mrs. Pickles discovers that by not trying new things, she has limited herself. In a way, because she discovers this by eating a different flavored ice cream than usual, this story can be helpful for parents or caregivers with picky eaters, as well as for children who may be more fearful or timid to try something new, like making friends. The rhyming nature of the story also helps builds children's phonological awareness. I told this story in Spanish using felt artwork for a shoe- and feet-themed program for both Spanish and bilingual story times (Mrs. Pickles loves to buy shoes, but only green ones will do!). Although it didn't rhyme when I retold it, it was still a fun story. Mrs. Pickle, whose story is told in rhyme with bright humorous illustrations, loves green and does not love change. She is a rather...matronly lady and it seems perfectly natural to read her lines in a stogy, snobby, matronly voice. Mrs. Pickle has a pickle mailbox, a green toaster and bakes pickle pies. Life was good for Mrs. Pickle until her youngest niece makes Mrs. P a deal she cannot refuse and she tries something new. This starts her on a quest to find out what else she has been missing by not trying new things earlier in her life. There are numerous points in the story for "audience participation" like counting all the pairs of green shoes on a two page spread in the middle of the book, and a discussion of which flavor ice cream we would choose - eggplant or tomato. My storytime audience really liked this one. The book that I got from the library has been read by many with most of the pages taped back together and scribbles here and there. The story of Mrs. Pickle revolves around the idea that she has tried everything and will not try anything new, until her niece places a bet with her to try a new kind of ice cream. It turns out the this small act opened her eyes to see that there are things that she has been missing out on because she hasn't tried everything! Throughout the book there are silly details like Mrs. Pickle cutting(/cleaning?) her lawn with a vacuum and having her dog help her pick out her clothes. Overall I enjoyed this book because it is important to stress, to people of all ages, that its a good thing to try new things because if you don't you won't know what your missing out on! This was a good book to read to my 4-year-old because there were things in the pictures we could talk about. I gave him hints for things to find. For example, I asked him what he saw in one photo that was "strange" and he found pickle shaped furniture including pillows on the couch, Mrs Pickle outside mowing her lawn with a vacuum, a pickle shaped lamp, etc. Another page has a bunch of green shoes on it but a few of them have an embellishment on so I asked my child to find the ones that were different. Another page shows her groceries (pickle cake mix, pickle ice cream, pickle milk, pickle bread, pickle juice, and pickle soup) so I asked him to talk about each item. Fun and funny book. I like pickles. But I'm relieved to say not THAT much! A book I think children will enjoy. Has a little "Green Eggs and Ham" flavor (ha ha!) to it. I think a preschool group would follow it, but I can't say that's it is a fabulous choice. I'll hold on to it in case I need a filler.6/29/10 & 7/1/10 Held attention. But it was not a "wow." Or even that much laughing. Then again, my Tue. group was extremely young and most were new faces. So that led to a lot of quiet throughout. The Thu. group made a bit more response, including the questions I asked. This book is so cute my children just love it! I also think it gives children a way of thinking that makes them try new things that they might be scared of. Mrs. Pickle only likes green and pickles and she doesn't want to try new things a lot like little kids when it comes to new foods or doing something different. But with the help of her niece Mrs. Pickle tries new things and is happy! great read! We made pickles after for canning it was a fun activity to go along with the book! Fun illustrations of Mrs. Pickle in her green dress making pickle pie in her pickle-themed house go great with the text that describes her picky picky ways. She doesn't want to try anything new until her niece pushes her to try a new flavor of ice cream. Suddenly, Mrs. Pickle discovers that she has been missing out on lots of fun things and gets out of her pickle rut. This books made me have flashbacks to a 4th grade teacher who was, for all intents and purposes, purple.Everything on her person, every day was either purple...or had a purple tint to it: blush, nail polish, leather coat, shoes, stockings, etc. Even her hair was frosted and seemed to reflect a tint of purple. Twas a bit out of hand. My mother used to read this book to me all the time. She would read it to me to always keep my mind open that I shouldn't be as pick as Picky Mrs. Pickle. There was some rhyming through out the book and the illustrations are very good. This book is a great way to help young kids to try new things. Hilarious! Adorable! A good lesson learned, along with humorous background details, silliness, and fun. Fantastic artwork, and a delightful story in rhythmic verse. Read this out loud today to second graders, and they loved it so much, we read it twice! A cute rhyme about trying new things. We love this book. We refer to it often when someone does not want to eat something or try something new. It usually works to change their mind about it. Rhyming text but not in an annoying way--actually quite fun...combined with excellent detailed pictures tell the tale of a lady who doesn't care to try anything new beyond her tried and true pickles. Very unusual and fun story about a lady who only likes the color green and will only eat green things, specifically pickles. Encourages children to try new things. Cute book that teaches kids it's okay to try new things. And, of course, how could you not like a book that refers to pickles on almost every page?!!!? Just saying!